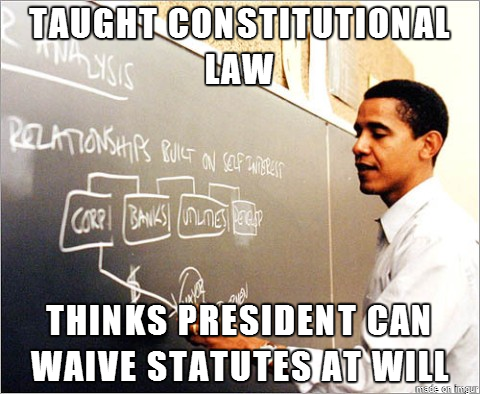 My Con Law Prof Flubs the Constitution…Again. Once again, my constitutional law professor has embarrassed me with his gross misunderstanding of the U.S. Constitution. First, he insisted that it would be “unprecedented” for the U.S. Supreme Court to overturn a statute enacted by a “democratically elected Congress.” Seventh-grade Civics students know that’s not right, but Mr. Obama’s misstatement did have its intended effect: It sent a clear signal that the President and his lackeys would call into question the legitimacy of the Supreme Court should it invalidate the Affordable Care Act (ACA). Duly warned, Chief Justice Roberts changed his vote in NFIB v. Sebelius to save the Court from whatever institutional damage Mr. Obama would have inflicted. Now President Obama – who chastised his predecessor for offending the constitutional order and insisted that he, a former constitutional law professor, would never stoop so low – has both violated his oath of office and flouted a key constitutional feature, the separation of powers. I’m speaking of the President’s “administrative fix” to the ACA. That “fix” consists of a presidential order not to enforce the Act’s minimum coverage provisions, a move that President Obama says will allow insurance companies to continue offering ACA non-compliant policies to those previously enrolled in them if the companies wish to do so and are able to obtain permission at the state level. Moreover, the President went further to say, “I promise not to collect a tax the Congress imposed.” Remember that the penalty for failure to carry ACA-compliant insurance is, for constitutional purposes, a tax. That was the central holding of last summer’s Obamacare decision, NFIB v. Sebelius. When the President assured victims of insurance cancellations that he would turn a blind eye to the law and allow their insurers to continue to offer canceled policies, he also implied that he would order his administration not to collect the taxes owed by those in ACA-noncompliant policies. Indeed, this matter was clarified in the letter the Department of Health and Human Services sent to state insurance commissioners notifying them of the Obama Administration’s decision not to enforce the law as written. That letter stated that the Department of the Treasury, which is charged (through the IRS) with collecting the ACA’s penalties/taxes, “concur[red] with the transitional relief afforded in this document.” That means the IRS, pursuant to the President’s order, is promising not to collect a tax the Congress has imposed. This, my friends, is a major disruption of the constitutional order. If the President of the United States may simply decide not to collect taxes imposed by the branch of government that has been given exclusive “Power to lay and collect Taxes,” the whole Constitution is thrown off-kilter. Any time a president wanted to favor some individuals, firms, or industries, he wouldn’t need to go to Congress for approval. No, he could just order his IRS not to collect taxes from those folks. Can’t get Congress to approve subsidies for green technologies? No worries. Just order your IRS not to collect taxes from firms in that sector. Or maybe even order a refundable tax credit. You think Congress has enacted job-killing regulations on an industry? Just invoke your enforcement discretion and ignore those rules. Whew! This sure makes things easier. President Obama twice promised, under oath, to “take Care that the Laws be faithfully executed.” Unfortunately, he also rammed through a terrible law. Our Constitution now gives him the option to enforce the enacted law and pay the political price, or seek Congress’s assistance to change the law. On the particular matter at issue here, Congress is willing to help the President out. On Friday, the House of Representatives voted to amend the law to allow insurance companies to continue to offer ACA non-compliant policies. Mr. Obama doesn’t like some details of the legislative fix he’s been offered. Unfortunately for him, though, he’s not a king. He has to work within the constitutional order. At least, that’s what I thought I learned in constitutional law. 2 responses to My Con Law Prof Flubs the Constitution…Again. I think you should have clarified the difference between the President changing a regulation by executive order and changing a statute, something Jay Carney tried to purposely blur. While the Constitutionality of Presidents just changing a regulation by an executive order is also somewhat dubious under the Constitution, altering or ignoring a statute is clearly unconstitutional.